62. What Internet bandwidth does the university have? Bredbandsskollen is a bandwidth measuring service. However, above 100 Mbit/s the service may be inaccurate regarding exact speed since it depend too much on the local computer and web browser performance. It requires Flash in the browser in order to work. For mobile and wireless networks it is quite usually good. SUNET had 2 x 40 Gbit/s connection to NORDUnet but now even more. 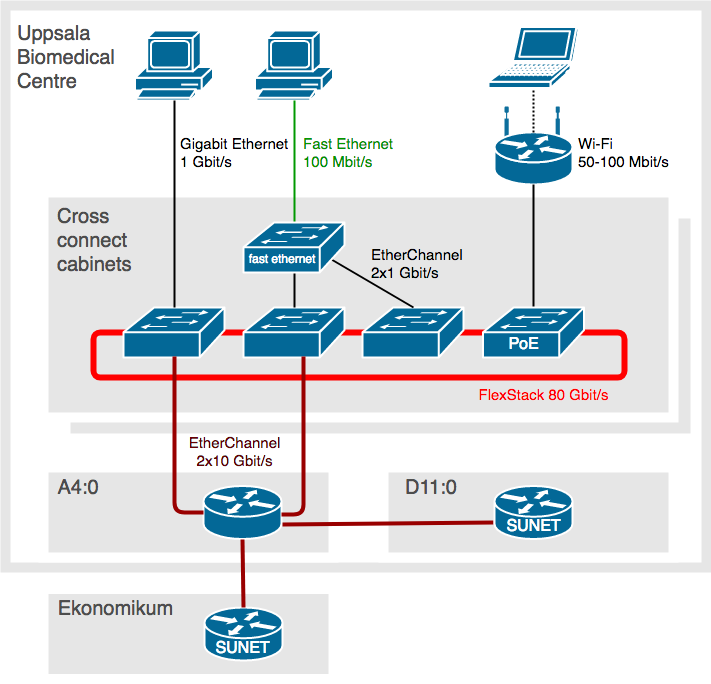 The Uppsala University network (UpUnet) had 2 x 10 Gbit/s bandwidth to OptoSUNET but are now connected to SunetC with 2 x 100 Gbit/s. BMC-campus-router has 2 x 10 Gbit/s to the rest of Uppsala University network (UpUnet) for the BMC-router and 4 x 10 Gbit/s for the BMC-hall-routers. 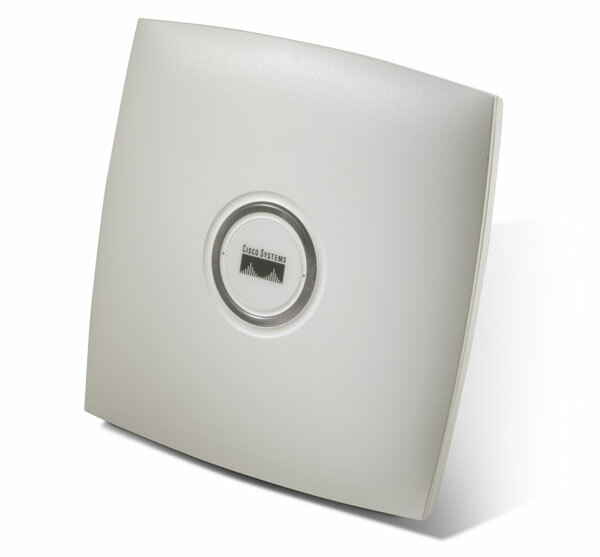 The network sockets at BMC are connected via either 100 Mbit/s (Fast Ethernet) or 1 Gbit/s (gigabit Ethernet) to the edge switches. If you only have Fast Ethernet and need gigabit let us know at helpdesk@bmc.uu.se. A few servers have 10 Gbit/s or multiple 1 Gbit/s. The network in BMC is built by Cisco equipment. Over the years we seem to have acquired all possible models, but mostly C5500, C3500, C2980, C2950, C2960, C2960S, C2960X, C2960XR. Our oldest Fast Ethernet switches - C5500, C3500 and C2980 - are currently being replaced (2015). Due to lack of personal resources this have been postponed. We will hopefully continue the upgrade in 2017-2018 and then also include replacement of all of the the C2950 and C2960 switches. Only C2960S, C2960X and C2960XR are left of the old. 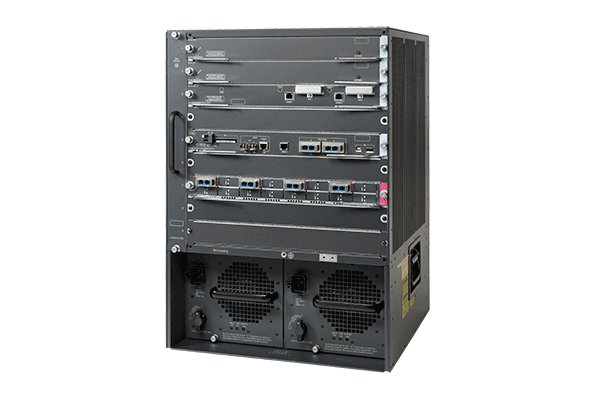 New cross connect cabinets are built with 10 Gbit/s or dual 1 Gbit/s uplink and flexstacked C2960X with 1 Gbit/s to the clients. Old switches without flexstack are connected via EtherChannel to the stack or have direct connections to the router. The idea with the network topology is that no switch failure should bring down any other switch. No single interface or transceiver (SFP/SFP+/GBIC) failure should interrupt any switch. The BMC-router is the big exception but Cisco 6500 series are in general quite reliable and can have multiple boards/interface cards. It is equipped with with redundant power supplies and is connected to a small dedicated UPS. Most of the wireless access points in BMC are Cisco AP1131 with support for IEEE 802.11a/b/g up to 54 Mbit/s but in practice less. We have a few Cisco AP2602i with support for IEEE 802.11a/b/g/n which are slightly faster, but usually not above 80-100 Mbit/s since most of them are limited by their connection to 100 Mbit/s PoE Fast Ethernet anyway.